February kicked off with a weekend art sale in Setauket, Long Island to raise funds for the final reconstruction stages of Chermaitre’s new kindergarten and community center. Our partnership with the St. James RC Church there was successful beyond our wildest imagination, and we are grateful to have been welcomed so heartily into the community. None of this would have been possible without Jeanine Morelli, a Vassar alum, who first invited VHP to host an event in Setauket. Below, Jeanine reflects on her experience with organizing the art sale. “I remember sitting in the cold room of the Parish Center at St James Church in early January with Lila, Andrew, Cindy and Tamsin. They had made the two and a half hour drive from Poughkeepsie to see the site for the art sale and meet with me to discuss the planning of the event for the following month. My son, Patrick, a 10th grader joined us after a friend dropped him off so I could drive him home. In retrospect, that unplanned event, was serendipitous as he became an essential part of the team. Meeting the team for the first time, I was impressed by their seriousness and dedication to this event. They were very professional and experienced. It made me a little nervous to see the investment they were putting into the sale as I was the one responsible for getting the community of Setauket to attend the event and hoped that VHP would make back their investment. Our meeting ended. Our tasks assigned. It was time to get to work. I observed how well the team worked. Work was shared and delegated. I tried to do the same. The banners arrived first. They were beautiful and colorful featuring the Haitian art work, Entanglement by Reynald Joseph. How appropriate! I didn’t know this was the name of the painting but it appropriately foreshadows my entanglement with the beautiful, intelligent, caring, inspiring people of VHP. I enlisted the junior high school students from our religious education program to help with the event and they did! They distributed 2000 postcards, put flyers in mailboxes, and signed up family members and friends to come, saved coins in their tipa tipa jars (tipa tipa means ‘step by step’ in Creole), baked for the sale, and entertained us with their music during the event. Meanwhile, the Poughkeepsie team was busy stretching canvases, selecting the art for the sale, determining prices and figuring out the logistics of how to get from Poughkeepsie to Setauket. The Friday before the sale, the first group of Vassar volunteers left Poughkeepsie. Their commute on the Long Island Expressway took 5 hours, but my friends arrived in good spirits, not discouraged. Wow, these are special people. I would have understood if they arrived grumpy. They were a little hungry and I’m glad I was prepared with snacks, but no Styrofoam cups this time like our first meeting. Another positive influence this group had on me! The morning of the sale, another team arrived. At the parish center, the volunteers quietly worked at their stations and I saw the room transform before my eyes. The same stark cold room that we had our first meeting in became a room of warmth and color and beauty and energy. 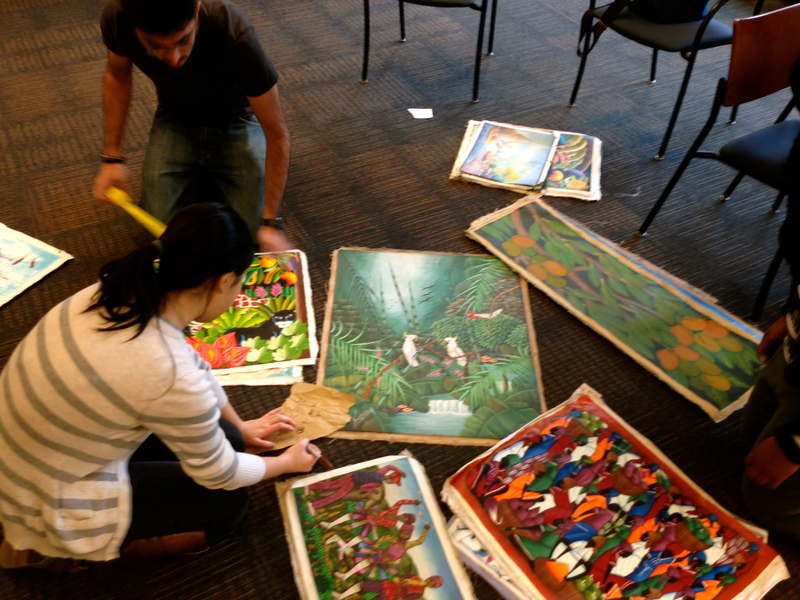 The morning before the art sale – volunteers are busy transforming the Parish Center! Then our guests arrived from the three village community of Setauket, Old Field, and Stony Brook – and they came and came. 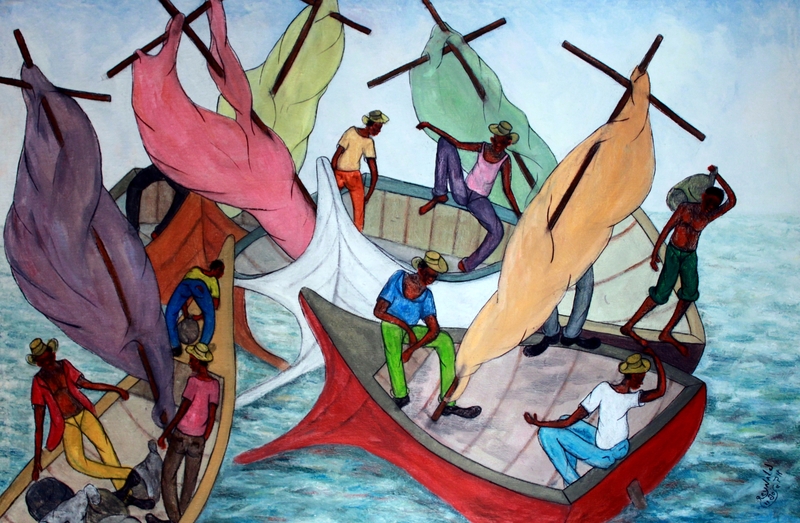 The guests were fascinated by the beautiful art and handcrafts make by the Haitian artists. Some people ran into old friends. On the second day of the sale, a woman from the community approached me. She came the first day after seeing the banners. She said that while she was there, she had a moment that was overwhelming. She looked around the room and saw the beautiful colors and art work, heard the beautiful music from our Setauket student volunteers, saw these energetic, friendly, helpful college students… It was a moment that spoke to her and stayed with her and nagged at her, and the next day she came back for more and bought another painting. Her story gave me pause because I knew what she was describing. 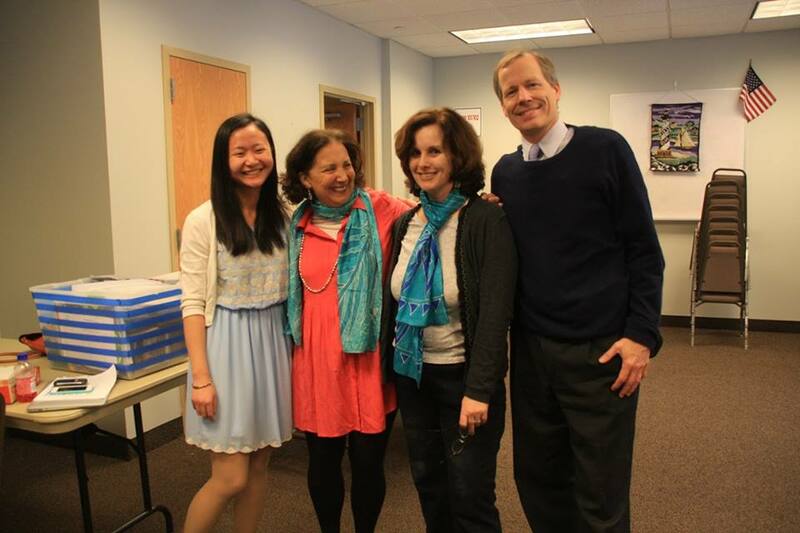 After tearing down the sale, Cindy Fung ’14, Lila Meade, Jeanine Morelli, and Andrew Meade share a moment of celebration. The art sale is not just a fundraiser. For me it was a life event. An experience that taught me that 30 years after graduating from Vassar that I am still part of that extended community. During those weeks that I was busily preparing for the event, I thought that I would be happy when it was over, but no. I was sad when I had to say good bye to my new friends. By giving my time, I felt connected to something bigger than myself. VHP has created something that connects all of us. The poor of Haiti and the affluent of Setauket. The young and the old. Those with gifted talents and those who are inspired by those gifts. Those who are involved with a church and those who are not. Photos from our weekend in Setauket can be viewed in our Facebook album here.